I believe God is involved in every step of a person’s life. Proverbs 21 provides one jumping off point. 1 The king's heart is a stream of water in the hand of the Lord; he turns it wherever he will. (ESV) I consider the end of the chapter a complementary bookend. 31 The horse is made ready for the day of battle, but the victory belongs to the Lord. (ESV) Consider how this plays out in the life of Christ. Augustus Caesar wants a census so Joseph and Mary have to travel to Bethlehem where Jesus is born in fulfillment of God’s word through the prophet Micah (5:2). When the Magi from the Orient show up and inquire in Herod’s court the location of the newborn king, Herod flips out, resulting in two more fulfilled prophecies. A massacre of the innocents in Bethlehem and an early childhood spent in Egypt. (Matthew 2:13-18). I presume God knew what would happen when the Magi came to visit Herod's court. 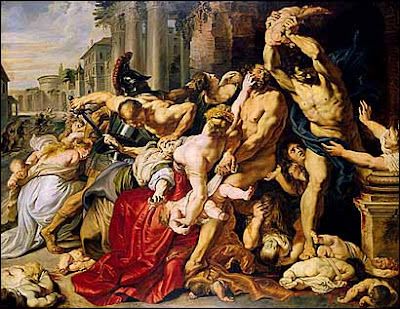 Perhaps the slaughter was small, 10-20 infants and toddlers, but grievously unjust, immoral, and atrocious. Why? Because the victims were innocent. A recent Bible study in Acts 12 which I attended led me to another New Testament example of collateral damage from God's intervention. The Apostle Peter has been thrown in jail by another Herod, Herod Agrippa 1. Herod had previously imprisoned and executed the Apostle James to acclaim by the Jews so he figured he would double down and do the same to Peter. The execution of James was unjust, immoral, and atrocious. Why? It was a murder for political gain. I contend that God was involved in that execution. But this isn't the collateral damage. 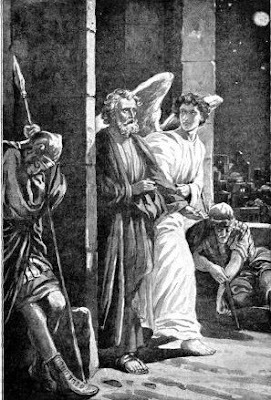 When the angel miraculously led Peter out of the jail (image source) in the middle of the night and liberated him to assure his friends who had been praying for him, the prison's guards were left holding the bag. The consequence for them was execution. 18 Now when day came, there was no little disturbance among the soldiers over what had become of Peter. 19 And after Herod searched for him and did not find him, he examined the sentries and ordered that they should be put to death. (ESV) Would their executions qualify as unjust? They were found guilty of something they had no power over. Solzhenitsyn tells many anecdotes in the Gulag Archipelago. One example is the geologist who was sent to the Gulag for subverting the state by not disclosing tin sources. S.'s quip is that he couldn't find ore in the area he was assigned, so he was declared criminal. But what of the innocents of Bethlehem? Was that king's heart immune from God's influence? Is God cruel? Perhaps not. When Job was suffering under the trials of Satan he wished he had been stillborn Job 3:16. In fact, Job sees some freedom in death in 3:17-19. 17 There the wicked cease from troubling, and there the weary are at rest. 18 There the prisoners are at ease together; they hear not the voice of the taskmaster. 19 The small and the great are there, and the slave is free from his master. Does a toddler understand the tragedy of injustice? I'm not saying that their massacre was not unjust. Nor am I saying their pain and suffering was not serious. However, I think the suffering is greater for the survivors than the victims. However, is there anyone more innocent that we have clear Biblical witness to who suffered at God's will? Is there a more unjust execution against one more innocent? Every time Peter preaches to the crowds in Jerusalem he tells them their guilt in crucifying Jesus, truly the only innocent person to ever walk the earth, yet in his prayer with the church in Acts 4 he says 27 for truly in this city there were gathered together against your holy servant Jesus, whom you anointed, both Herod and Pontius Pilate, along with the Gentiles and the peoples of Israel, 28 to do whatever your hand and your plan had predestined to take place. (ESV) The unjust death Jesus suffered was part of God's plan at the hands of the Herod, Pilate, Roman soldiers and the Jewish religious leaders. In my theology of death, God is involved in everyone's expiration.